Here's a simple and equally pretty salad or appetizer to serve at your next party. Just be sure your guests like cilantro...if not...I would think a suitable substitute would be a combination of fresh basil and parsley! *To make your tuna easier to cube, place the tuna steaks in the freezer for about 15-20 minutes before slicing, this ensures it's nice and cold too! 2.) Dice up super fresh Ahi Tuna and place in a bowl. 3.) Spoon some of the prepared vinaigrette onto the tuna and mix together. 4.) Spoon some Cilantro-Lime Vinaigrette on the bottom of a plate. 5.) Place a circle cookie cutter (or food shaper) centered on top of the vinaigrette. 6.) 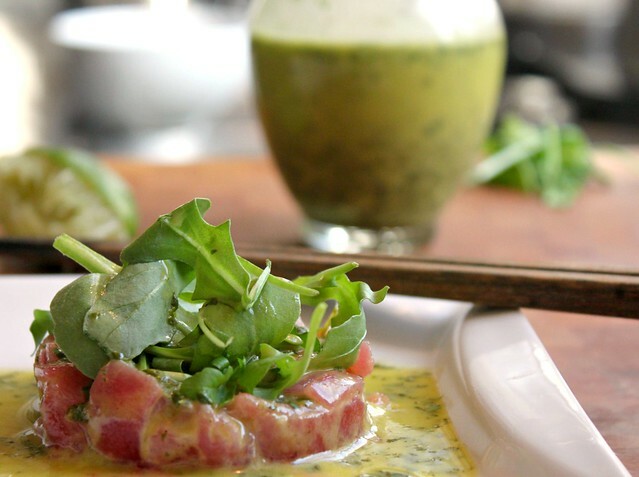 Spoon tuna ceviche into the circle and lightly pack it down. 7.) Remove the circle, top with a bit of baby arugula and drizzle with a tad more vinaigrette. Place all ingredients in a food processor and blend until smooth vinaigrette consistency. 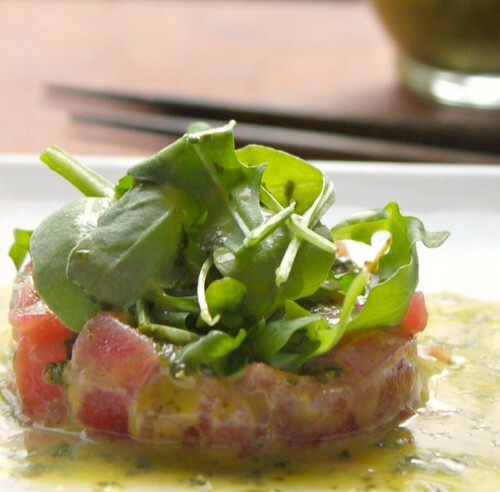 I think I could live on tuna tartare, tuna ceviche, tuna rolls...anything with raw tuna is okay by me. Love this vinaigrette...everything sounds so fresh and bright! An absolutely amazing looking dish!! YUM! I feel bad saying it but I'm not sure I trust people that don't like cilantro. It's really short sighted of me too considering I hated it up until I was 20. But then I saw the light. This recipe and photo is so beautiful. Makes me want to have a dinner party tonight! This is a really impressive dish that sounds easy to put together with your instructions. It sounds so fresh, too. The perfect thing to eat after an indulgent few weeks.